April’s Friday for the Arts! For April we will be showing the work of Steve Harris. The exhibit features sculptures and drawings. The elements of everyday life inspire Harris in his artwork. He is influenced by the works of Michelangelo, Rodin and Da Vinci. A story, sometimes generated by current events, revolves around each piece. The drawings on exhibit include mixed media of pencil, watercolor, ink pen, and tempera. His latest sculpture centers around his young grandsons' favorite puppets coming to life. Harris uses the subtractive method in creating the sculptures, carving from a solid block of plaster and tempera. Using a variety of tools, including dental tools for fine details, the works take from 50 to 700 hours to complete. As many as 30 figures are represented in some sculptures. Harris has been featured in one man shows at The Last Stop Gallery, Richmond; Meredith Gallery, VSU; Petersburg Area Art League Gallery; Hampton University and local public libraries. He has also exhibited in juried shows in Richmond, the Tidewater Area, Tri-City Area and in Northern Virginia where he won numerous Best -in-Show and First Place Awards. Harris taught middle school art in Chesterfield County for 35 years and was awarded Art Teacher of the Year. During his teaching career, he also coached track and volleyball. Following retirement, he taught design at VSU for two years. A native of Williamsburg, Harris received a BS in Fine Arts at Virginia State University and a Masters in Education degree also from VSU. For our March show in the Main Gallery, we will be showing the abstract paintings of George Fatseas. Currently an abstract artist, George’s medium is oil paint. Before his epiphany about a year ago, he was an impressionist, expressionist, realist, portraitist and more. What has always been a constant is his use of color to define paintings and elicit emotions. Many of George’s recent paintings have been triptych canvases where he uses color to tie the three panels together. George had some formal training in college and continued to paint upon graduation. Years went by when he didn’t have the time or energy to paint, but he continued his studies through videos and online seminars. About twenty years ago, he had more time and energy and he started to paint in earnest; putting to canvas the backlog of cerebral creations. George retired a few years ago and has started his full time job as an artist. He states, “I have always been an artist in my heart, and now I get to live my dream of painting all the images in my brain that accumulated when I couldn’t paint. I’m loving every minute of it”. This month, PAAL will exhibit a selection from its Permanent Collection. Many of the works on display were acquired through purchase prizes at PAAL's long-running Poplar Lawn Art Festival, in its heyday one of the outstanding art festivals on the East Coast. The festival took place at one end of Garden Week in Virginia, and the Prince George Heritage Fair took place at the other end. Sometimes the Petersburg Symphony Orchestra performed in the park during the weekend. It cries out for revival. This Friday for the Arts we have the privilege of showing the work of Nan Jones. Nan was instrumental in the formation of PAAL in the 1930s, and without her PAAL would not have the permanent home at 7 E Old St. Join us this Friday, November 9th between 6:00 -9:00 and view this historic collection of works. In the Main Gallery, Henry Kidd is pleased to present an exhibition of some of his well-known works in an show entitled, "Past Glories and New Directions". In recent years Henry’s has gone in a new direction it his artwork. His work now reflects his love of travel, European masters and history. He has switched from color pencils to painting. A short biography indicates Henry's wide spread interests. A lifelong resident of Colonial Heights, Virginia; he graduated from Virginia State University with a BS in Art Education. As a nationally known Historical Artist, his work has appeared in documentaries and on covers of books and magazines. A commissioned artist for the US Army Ordnance Department, his artwork is displayed in many museums such as West Point, Virginia Historical Society, and the Museum of the Confederacy. Henry is involved in the military history of our area, serving as a Civil War reenactor with the 12th Va. Infantry and a Revolutionary War reenactor with the 7th Va. Infantry. He is also working part time as a historical tour guide in Richmond and Petersburg. He is deeply involved in our country’s remembrance of the tragedies of 9/11. Henry raised $25,000 for September 11th victims through the sale of his artwork, ‘America’s Heroes’ and he has presented more than three hundred framed ‘America’s Heroes’ prints to Fire Houses and Police Precincts in New York, Northern Virginia and Pennsylvania. A recipient of a National Citizenship Award from the Daughters of the American Revolution for his work to aid September 11th victims, he was also recognized by Virginia General Assembly with a Joint House and Senate Resolution for artwork and efforts aiding September 11th victims. In the Members' Gallery, PAAL is excited to present a special exhibit about the events of the Petersburg tornado of 1993. Michael Edwards has put together the exhibit entitled: A Day Of Terror, The Roof Just Went Away. Items on display will depict the Petersburg Tornado of 1993, using pictures and numerous newspaper articles from various networks. Edwards notes, "This year we reflect on 25 years into the past of such a dreadful day. If you look around closely, the echoes of that day still linger." Our July show will feature the exciting new works of Jasmine Mills in her show "Black & White" in the Main Gallery. The artist explores texture and contrast with abstraction and figurative expression, where her previous bodies of works focused on vivid use of color and Pop Art influences. Upstairs in the Member's Gallery, PAAL is excited to present the show: Visions and Experimentation. Pat Harvey is a juried, visionary artist whose amalgamation of traditional and non-traditional styles and mediums is used to create into worlds both real and fantastic. Jerry Harvey, a retired Army dentist, is an award-winning woodworker who utilizes exotic wood and creative stain and finish techniques to create artistic occasional tables, turned bowls and miniature boxes. For our June show, PAAL will feature works of of a returning artist as well as introducing a new talent. Of her artistry, Sandra says: “I have tried many forms of creating art, sculpting, fabric, and digital art. But my favorite, is painting. I prefer oils because of the luminosity of the medium and of course, the forgiveness! In addition to the pieces in her current show, Sandra will also hold a book signing. Ellis Island Immigrants: Faces of America is my first book and is a collection of 24 of my portraits of immigrants and their photos taken on Ellis Island from the late 1800s to the early 1920s. (This collection was displayed at PAAL last year, thanks to Russell!) The book will be for sale at $21.95 and I will sign the numbered copy for you. Upstairs in the Member's Gallery PAAL is excited to introduce a new artist: DeAndre Tatum. For our April show, PAAL is excited to again feature works of well-known artists who have exhibited with us before. The title of Bob's show is " God's People, Places and Creatures" a collection of paintings to include paintings of John Muir, Amelia Earhart, Puffins on Staffia, Cowgirl, Peaks of Otter and others. This month for Friday for the Arts, PAAL is excited to have some of our favorite artists returning to our Galleries. We are all endowed with some kind of gift. It is up to us to leave the world better than when we entered. Both the world and we being improved as we embrace our gifts and use them. I was five years old when a silent bell tolled and I became aware that my gift was in drawing. From there I was given clues to direct me in my journey to fulfillment. Unfortunately, I missed most of them. This show reflects a real attempt to get back on track after years of starting and stopping - getting side tracked, seeing false idols and finding dead ends. Time has not been wasted but used to accept hard lessons and letting go of an ego. To create not for self or others but to just create. To use the gift to the best of my ability. This month the Petersburg Area Art League will open 2018 with the works of two local artists who have been featured in our galleries in the past. In the Main Gallery you will be treated to the acrylic paintings in Eugene R. Vango's abstract expressionist style. However, he will also display many paintings never seen before incorporating still life objects into his style. Vango, a native of Norfolk, attended Booker T. Washington High School. Upon graduating from high school, he entered the [then] Virginia State College. While at VSC, he was an active exhibitor. During his last year, he was accepted into the Biennial Atlanta University exhibition. Some years later, he would win two Honorable Mentions in that show. He holds a Bachelor of Science degree in Art Education and earned his M.F.A. from Penn State University in 1972. Since then Vango has won numerous 1st place and Best in Show Awards. He is often called upon to jury local and national shows. His work has also been accepted in a number of juried exhibitions at galleries and museums. He continues to exhibit, demonstrate, lecture and occasionally serves as consultant and evaluator for accrediting agencies. Art to me, is an intellectual pursuit and a source of the most supreme creative pleasure. There is something magical about color and light that prompts an artist to continuously discover the enormous dynamic possibilities of these elements that goes beyond their traditional use in interpreting physical reality. My inspiration at this time comes from my experience with African art and culture. The Africans have a rich tradition when it comes to the use of color for practical and ceremonial purposes. I especially enjoy looking at African fabric designs which have an incredible balance of cool and warm colors. This is a rich heritage that provided the foundations for modern art. Traditionally abstract art has not been looked upon favorably by the Black community, but very few people realize that abstract art has been practiced by Africans for centuries before modern art was embraced by Europeans. Other influences over the years have been the Abstract Expressionists and the artists of the California School of Colorist. I started out with oils in the late sixties but as of the seventies, I have been painting with acrylic. And, now I have expanded into the field of digital art. To kick off the use of the new Upstairs Gallery, PAAL is excited to present the works of Lisa Mistry. Come see her artistry on display in our new and exciting renovated Upstairs Gallery space. This Friday for the Arts!, the Petersburg Area Art League will feature a “History Show” in celebration of its 85th birthday. The Main Gallery will be filled with photographs of the PAAL building, reflecting the many changes through the years. Photos taken of the building following the Tornado of 1993 will also be on display. Included in the exhibit will be a portion of PAAL’s permanent collection, memorabilia, and examples of PAAL’s current programming. The exhibit will take the visitor on a journey through time from the beginning of PAAL to the present day. Members’ Gallery Exhibit “Discover the Art of Paul Guyot (1936-1975)” features a variety of works by this French painter completed during the 1960’s and 70’s. The artistic center Conches in Normandy, where Guyot worked, inspired his oil paintings and engravings of landscapes and still lifes. The recipient of numerous awards, Guyot rose to fame, which was prematurely ended by illness and his death in 1975. These beautiful works of art are being shared with PAAL by one of its members. Upstairs Gallery will hold a Silent Auction featuring art work donated by members of PAAL and other local area artists. The proceeds from this “one night only” auction will be used to buy supplies for the “Art Collective” that meets twice monthly at PAAL. The November exhibit runs through Friday, December 1, 2017. Show Title : A Community Without Unity is but a Shadow of Defeat"
Josue commented: "The show is titled after the 60" beehive wall hanging sculpture included in this exhibition. That piece is my response to the current struggles and frustrations we have as Americans. The pieces shown here are but a fraction of the pieces that will be included in the show. The small furniture pieces will be displayed on small podiums. There will also be to other mixed sculptures on podiums. I am currently vigorously working in finishing a huge painting just for this show." 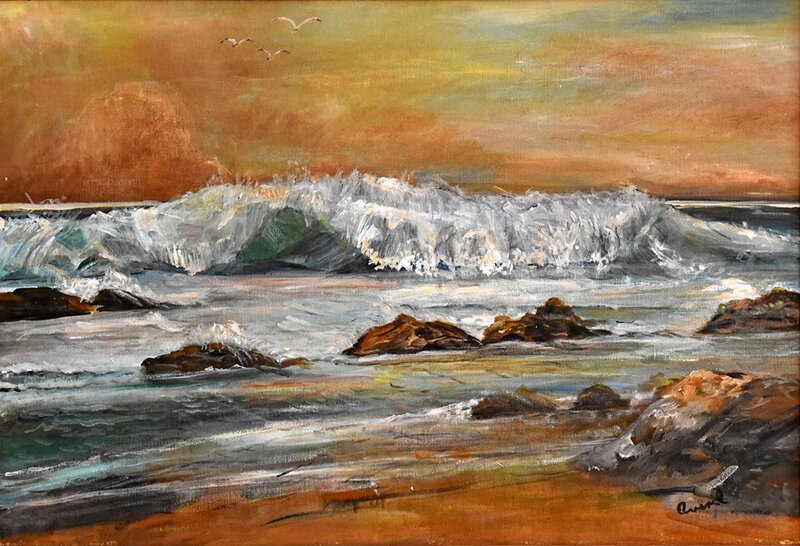 In the Main Gallery, the Petersburg Area Art League will feature a new collection of paintings by local artist, Rod Givens, entitled, “The Quiet.” "The quiet", Rod states, "is at the end of the day when I sit and look at my work. It can be especially fulfilling after a good painting day. It's that quiet that takes over and calms the fears and turbulence in my mind and inspires a new day of painting." Rod continues, "This has been a clearing of the direction which is less restrained and simpler. The paintings have an ethereal playfulness and wit about them, but with an underlying sense of dread.” Rod states, “I am afraid of everything, thus I make art.” Rod has exhibited in many group shows and several one man shows. This is his second show at PAAL. “4 Years Later” features artwork by pastel artist, Patricia Munford. After one year of retirement, Patricia Munford held her first exhibition of soft pastels in PAAL’s Members’ Gallery. Now, four years later, Ms. Munford is exhibiting some of her newest drawings, including several from her Night Lights series. She states, “I saw the moon and Venus from my back deck and wanted to try drawing the crescent of light in the dark sky. Then I decided to do a series of nightscapes using the same tree formation in the foreground.” Five of the series will be on exhibit in the Members’ Gallery. In conjunction with the Gallery art exhibits, the popular Hatcher’s Run Band will perform in the outdoor Art Park from 6:00-8:00. The Upstairs Gallery will feature line dancing with the Tri-Cities Soul Dancers starting at 7:00. The September exhibit runs through Friday, October 6th. Call 804-861-4611 for more information or visit www.paalart.org. PAAL is located at 7 East Old Street in Petersburg.